Labour Party leader Jeremy Corbyn awaits election results for his Islington North constituency in London, 9 June. Thursday’s general election was an earthquake for the UK’s political establishment. And although the issue did not feature in the campaign, the result has significant implications for the Palestinian cause. Labour Party leader Jeremy Corbyn has been a lifelong supporter of the Palestinian struggle for justice. In an August 2015 interview with The Electronic Intifada, he called for an arms embargo on Israel and supported other key elements of BDS, the boycott, divestment and sanctions movement for Palestinian rights. His party’s 2017 manifesto pledged that a Labour government would “immediately recognize the state of Palestine” – a position the governing Conservatives oppose. Due to his positions on Palestine, throughout 2016 Corbyn faced a relentless, manufactured campaign charging that under his leadership the Labour Party was rife with anti-Semitism. A witch hunt by the party machine led to dozens of members being suspended on baseless or grossly exaggerated accusations pushed by a hostile media establishment, right-wing Labour lawmakers and Israel lobby groups. In some cases, accusations of left-wing anti-Semitism were entirely fabricated. Even the head of Labour Friends of Israel, lawmaker Joan Ryan, was caught by an underdercover Al Jazeera investigation broadcast in January fabricating allegations of anti-Semitism against a party member who questioned Israel’s settlements in the occupied West Bank. A lobby group within the party, Labour Friends of Israel coordinates its activities with the Israeli embassy, which has provided funding to secretive efforts to win lawmakers over to Israel’s cause. Last week Ryan was re-elected as Labour member of Parliament for Enfield North. Like many in her party she rode Corbyn’s coat tails to an increased majority – despite her own efforts to sabotage the Labour leader and other supporters of Palestinian rights. Despite “your misgivings about the Labour leadership,” Ryan wrote, “I hope that you will consider voting for me as your local MP.” She promised if re-elected “to work for a Labour Party that once again can deserve your confidence” – a not so subtle suggestion that it did not deserve their confidence in this election. Her letter echoed the complaints of several right-wing Labour candidates who told media – usually anonymously – that they would be fighting “local” campaigns to distance themselves from Corbyn and the Labour manifesto. Another key figure in the efforts to smear Corbyn and the Labour Party is veteran Israel lobbyist Jeremy Newmark, Labour’s candidate for a North London seat. The Jewish Chronicle reported that Newmark ran a similar anti-Corbyn campaign in the Finchley and Golders Green constituency where he contested the election. Newmark became chair of a revived Jewish Labour Movement in February 2016. Soon after, the JLM was at the center of efforts to hype up the anti-Semitism crisis. Newmark has a well-documented record of making false accusations of anti-Jewish bigotry as part of his efforts to silence and discredit the Palestine solidarity movement. A longtime Israel lobbyist, Newmark was revealed by Al Jazeera’s undercover investigation in January to still be working closely with the Israeli embassy during the 2016 Labour Party conference. A still from Al Jazeera’s The Lobby shows Jewish Labour Movement chair Jeremy Newmark, right, with Shai Masot, the Israeli embassy officer caught plotting to “take down” a senior UK government minister. He was filmed at a closed-door meeting joking and discussing strategy with disgraced embassy agent Shai Masot and Ambassador Mark Regev. Israel quickly called Masot back to Tel Aviv after the Al Jazeera investigation made headlines. Masot had been caught on video plotting with a civil servant to “take down” a senior British government minister perceived as critical of Israel. Despite his record of dishonesty, Newmark was selected as a Labour candidate. He then used his media platform in an effort to revive the discredited anti-Semitism smears. On election day, Newmark narrowly failed to take the seat from Conservative incumbent Mike Freer – who is also staunchly pro-Israel. Another key Jewish Labour Movement figure is vice chair Mike Katz, who unsuccessfully contested the neighboring North London seat of Hendon. In a debate on the J-TV YouTube channel, Katz’s Conservative opponent Matthew Offord accused Katz of being “put up” to fight the seat by the Labour establishment, in an area with a significant Jewish population. The Conservative lawmaker may have had a point. The Electronic Intifada understands that there was a power struggle between the party establishment in Labour headquarters and Corbyn’s office over the list of candidates, with the latter being outmaneuvered in many cases. After the election, Katz claimed that the anti-Semitism allegedly rife in the Corbyn-led Labour Party had been a factor in his defeat. Newmark and Katz took a break from campaigning last month to participate in an Israeli embassy reception celebrating Israel’s “independence” – the 1948 ethnic cleansing of 750,000 Palestinians from their homeland – as well as the 50th anniversary of Israel’s military occupation of East Jerusalem. 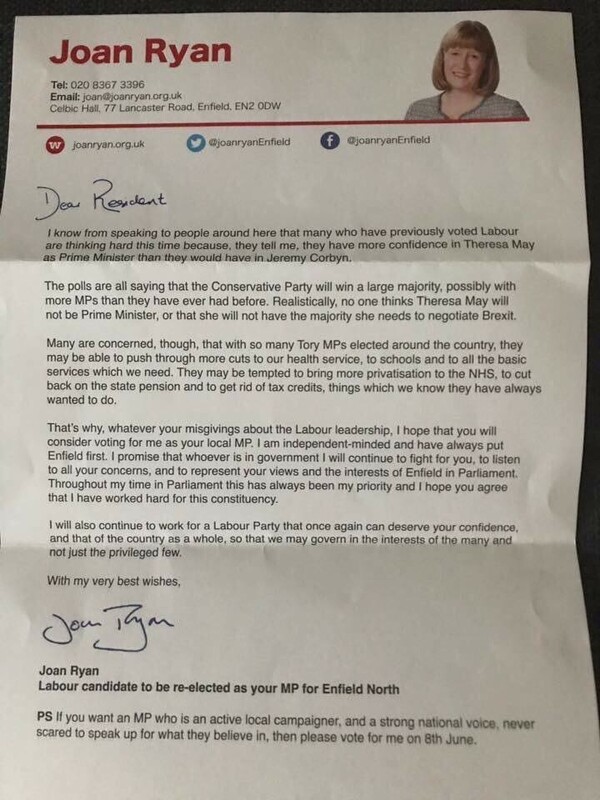 The irony for people like Joan Ryan, and her fellow Labour “friend of Israel” Wes Streeting – another vocal stoker of the anti-Semitism allegations last year – is that the massive swings to Labour achieved by the Corbyn-led party often saved them in their seats. The surge in turnout for Labour even helped Streeting substantially increase his razor-thin majority. Clayton Swisher, head of Al Jazeera’s investigative unit, commented on Twitter that the UK election result was a loss for Israel’s “covert influence campaign” in the UK. A key element in that campaign was the effort to attract Labour-leaning youth to Israel’s cause. It has clearly made no headway. Corbyn, the lifelong Palestine and anti-war campaigner, enthused and mobilized young people to vote Labour with a manifesto of ending austerity, providing free university tuition and redressing growing inequality. Swisher predicts that the result will lead to a crisis at Israel’s strategic affairs ministry – the government department which spends tens of millions of dollars to fight BDS and to market Israel to progressive Western audiences. Corbyn’s position as Labour leader now looks unassailable. Though short of the seats he needs to become prime minister, Corbyn pulled off stunning gains when the consensus outside the grassroots movement that supported him was that Labour would suffer an historic defeat. Labour saw its share of the vote surge to 40 percent, just behind May’s Conservatives who in a stunning upset lost their parliamentary majority. One of his most bitter critics, the staunchly pro-Israel pundit Stephen Pollard, noted that, in terms of the increase in vote share, the Labour leader had outperformed every one of his predecessors since Clement Attlee’s landslide win against Winston Churchill in 1945. That Labour government created the National Health Service and the postwar welfare state that brought millions of people out of sickness and poverty. Without a majority, May has done a deal with Northern Ireland’s hard-right Democratic Unionist Party, which has a history of sectarian bigotry and ties to violent extremist groups. The Christian Zionist DUP’s 10 seats will allow May to cling to office in exchange for as yet unspecified concessions. Even May’s predecessor, former Conservative prime minister John Major, has warned that her deal with the DUP could endanger the peace process in Ireland. May sold her leadership as “strong and stable” and warned voters not to elect a “coalition of chaos” led by Labour. But it is her weak minority government, reliant on partners even senior figures in her own party can’t stomach, that looks unlikely to endure. Another election may come soon. A key message from this one that is energizing people in the UK and around the world is that left-wing policies, encompassing strong support for Palestinian rights, form a realistic and winning program. 10 days before the election, 0n Monday 29 May, the Daily Telegraph dedicated most of its front page and two pages inside in an attempt to smear Jeremy Corbyn by association with various acts of terrorism in the aftermath of the Manchester Arena bombing including, on the basis of the most tenuous link a picture of the siege at the 1972 Munich Olympics. The opening paragraph suggested he had been condemned generally by our Party, but the only direct quotation on the front page was from the Director of Labour Friends of Israel, Jennifer Gerber, who is also a member of the Board of Directors of Progress Limited the company that controls the Progress organisation, which is a ‘New Labour’ interest group founded by Lord Peter Mandelson of Foy. To quote Jeremy: "Democracy is a very wondrous thing and can throw up some very unexpected results". I am so looking forward to the next general election in Palestine, I am confident all readers and contributors to this website will agree. it seems strangely overdue. Do Debbie Wasserman-Schulz and John Pedesta now work for the Labour Party? When progressives are winning, Zionists are losing. anti-BDS front. Al Jazeera's documentary "The Lobby" offered a vivid closeup picture of Israel's brazen interference in U.K. politics. Blackmail, campaigns of vilification, secret payments, calculated lies, smears, manipulation of decision-making within the Labour Party, creation of phony front groups, all under the direct supervision of Ambassador Regev and his team of agents, were recorded and revealed in exquisite detail. The effect in political circles as with the wider public has been to open people's eyes to what's been going on and encourage them to focus on new possibilities. This being said, the tremendous showing at the polls by Labour means that the likes of Jeremy Newmark, Joan Ryan, Angela Eagle et al will no longer command the attention they previously enjoyed. Indeed, Corbyn's most bitter detractors in the Parliamentary Labour Party have been saved from their own folly by their leader's demonstrated appeal at the ballot box. The story now, whether the media like it or not, is the disastrous nature of the Tory government and the welcome coherence of Labour's program in the next election, an event likely to be upon us within a year's time. Israel and her "friends" threw everything at Corbyn, and all they got was a bad case of exposure. The "new antisemitism" is hasbara code for identifying any person who does not support the State of Israel 100%, "right or wrong." In other words, if you even so much as challenge the illegal Israeli policy of building new Jewish-only settlements on the Palestinian West Bank, you are -- by definition -- an antisemite. Thanks Tony. Please do email me the link to your WW article when it’s up. For decades members of the DUP have referred to the indigenous Roman Catholic population of the North of Ireland as rabbits and vermin; it is quite clear they will think no better of our oppressed brothers and sisters in Palestine. I just hope that Roman Catholics, and indeed all people of Faith, in Britain speak out against the reintroduction of bigotry and hatred into their parliament. The issue of religious intolerance was resolved several centuries ago in Britain. It is so sad and indeed unbelievable that this Tory-DUP coalition is attempting to turn the clock back to a time in Britain when the British parliament was at the centre of sectarian hatred and violence against its own people, here in Ireland, and abroad.